We start with Henry (Harry) Croswell who was born in 1774 and died in September 1862, buried at Killanummery Churchyard. There is a record of a Henry Corswell (sic) of Killanummery in the Irish Flax Growers list of 1796 though it is uncertain whether this refers to Harry or possibly his father. Harry fought in many of the Peninsular wars and Waterloo, after which he retired on an N.C. Officer's pension and was appointed local clerk of the Petty Sessions. About 1818 he married Miss Jane Mape and they set up house at the roadside house at Cadda (Corglancy). Jane was a very enlightened and well-educated woman. In this little cottage they had 11 children - Catherine b.1820, Anne b.1822 (Mrs Caldwell), Maria b.1823 (Mrs Hamilton), Jane b.1825 (Mrs Wilson), Henry b.1827, Percy b.1829, William b.1831, Joshua b.1833, Esther b.1834 (Mrs Robinson), Sarah b.1837 (Mrs Nixon), and Joseph b.1839. Joshua and Percy became policemen, Henry a civil bill officer, Joseph a summons server and William became a soldier in the East India Company who fought in the Indian Mutiny (see obituary for details of his career). The Cresswell family were generally distinguished for great hardihood, activity and intelligence and were obviously of a good yeoman class (as described by James Peyton Hamilton). They were connected with many of the official classes such as police, law officers, some doctors and lawyers. 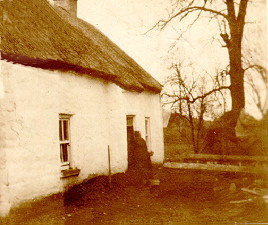 Corglancy where she had earlier lived as housekeeper with her uncles Henry and Joseph Cresswell. The name change from Croswell to Cresswell was not adopted by all the children, nor is the reason for it known, but it seems as if William was one of the first to use the name Cresswell as was shown when he enlisted in 1850. Maria (b.1823) was my great-grandmother.